I was over at MotoringFun.com to check out the recent live interview with Fireball Tim and noticed that dcmini was linked up over at Pedro's site. Very cool and much appreciated! So I went to visit some other MINI blogs that I frequent and low and behold dcmini is linked on many other blogs as well. Thanks for to all for linkin' me up. Its greatly appreciated. And be sure to check out MotoringFun.com. Pedro does a great job at keeping things interesting over there as well as great chat room. If you linked me on your blog/site, or know of a good one and would like it to be added to my list, just click be added and send me the link. [UPDATE] With the recent redesign of GoMotoring.com, Mark was kind enough to add dcmini to the front page of live RSS feeds instead of the links page which no longer exists. Thanks Mark! and site looks great! 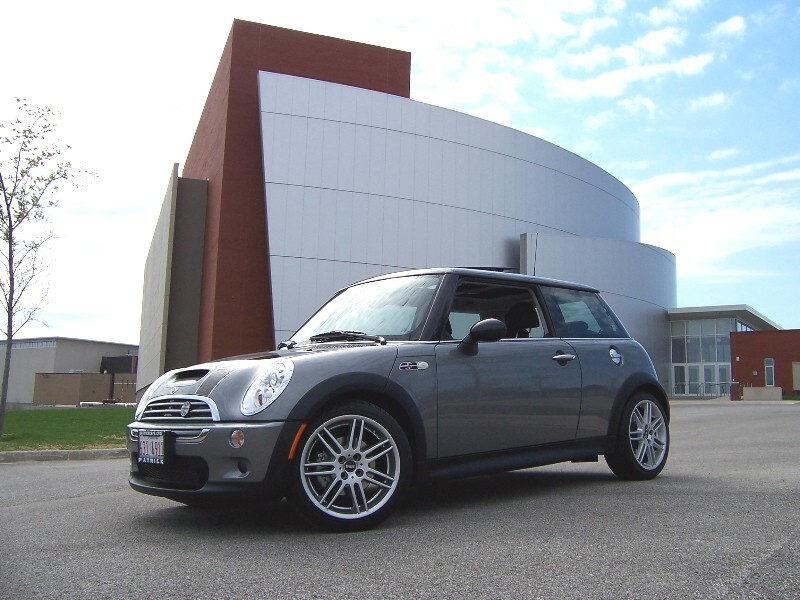 While I waited I surfed the internet with the dealer's free wireless broadband connection and caught up on all my MINI related news and blogs. 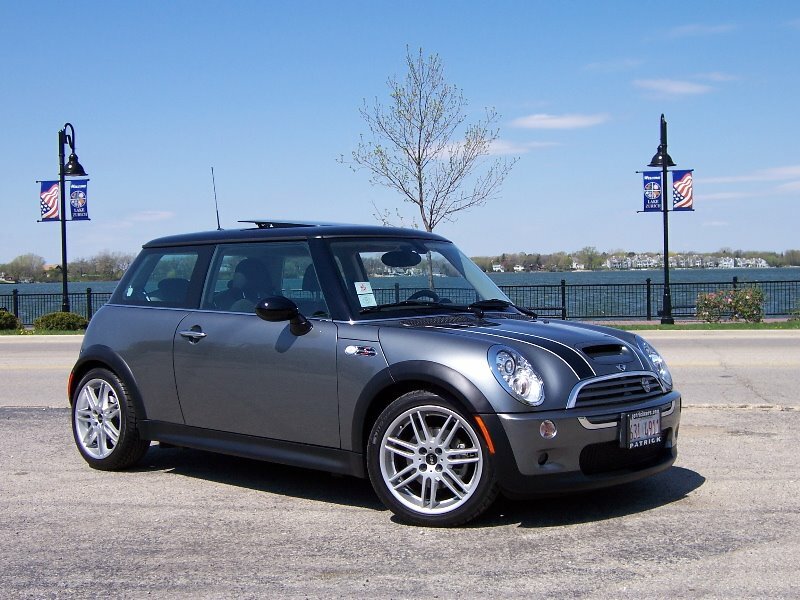 Great service from Patrick MINI once again. Thumbs Up. As an architect, I have a variety of types of clients; from the money hungry developers to the planet-loving tree-huggers. But it is extremely rare to get a client who not only cares about sustainable green architecture, but has enough trust in you to let design something bold and out of the comfort zone. It is with these types of clients that architecture can be truly rewarding. Such was the case with this vacation home we designed. I saw this project grow from a tiny sketch on a piece of trace paper to realization. And to top thing off, the client extended an offer to me that I just could not pass up; to spend the week end there to experience the home for myself. Wow. How cool is that. It has been a while since I've been up to see the progress of a vacation home we designed. Usually when a project is done, we really never get an opportunity to actually spend a lot of time living in the house. I couldn't help but relax in this vacation home with its radiant floor heating, jaw dropping view of Lake Michigan and secluded location. The four hour drive was absolutely worth it. This is officially my first design that I have slept in. I always feared that I would be overly critical seeing everything that was compromised but due to the wonderful clients and their trusting nature, there weren't any compromises. This is truly a great project that I am particularly proud of. This project did make it in the Chicago Home Magazine back in the spring debut issue (page 115) but that was pre construction. Hopefully soon this project will soon be featured in some other magazines in the near future. But for now here is some pictures of the finished house. There has been a lot of rumors floating around saying that the end of Webb MotorSports was near. Due to the less than perfect customer support, many were venting their frustration on threads like this one. But Randy Webb just wanted to set the record straight. We are not going out of business, going bankrupt, closing the shop, etc. I have heard these and it makes me laugh knowing how busy we are.. He is also getting back into flying again. Not sure why exactly if he's so busy at the shop but it gives him quality time to answer emails and forum posts during his layovers. The WMS forum is all cleaned up and is showing some activity. Hope all this works out. Randy has a great MINI mind. He installed my 15% WMS reduction pulley, WMS HDI Intake and Miltek Exhaust at the last pulley party in Chicago, and I'm glad he did. Read the full update from Randy Webb here. That's right. 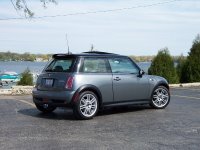 The '08 MCSa R56 will be available on a JCW variant! Better known as the elusive MCSa JCW. 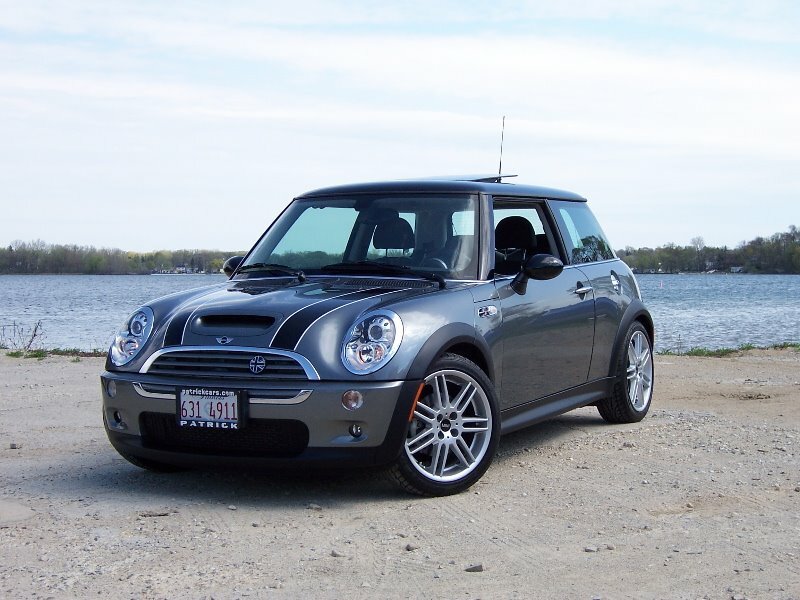 Hopefully, it will come with all its JCW goodness, smoothness and nimbleness. As an owner of an MCSa with Miltek exhaust, 15% reduced pulley and a WMS HDI intake, these mods have made a world of a difference in responsiveness and overall smoothness. But the power-band doesn't really kick in until about 4k rpm. As this is also evident in non-automatics as well, many have reconsidered the whole JCW package as a worth while option. 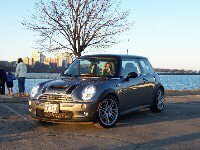 Many JCW owners claimed that the power-band is clearly evident at very low rpm's as compared with the most common modifications many other MCS owners have added to their cars. Now the question is can they do the same with the '08 MCSa R56. Hopefully the JCWa will be as potent as the MCS JCW. Of course it will. Apple updated there iMacs with a monster 24" version. In true apple fashion, they certainly are not done. Today they are about to launch a few new items. Here is an unconfirmed agenda of today's event. • Discussion on iTunes software, iTMS integration into iTunes, and iTMS sales and facts. • Announces Movie Store. Available Immediately will be movies from Disney and Pixar, among other studios. • One More Thing....TubePort. A $99 2-piece set that includes a dongle that connects via USB to your mac, and another dongle that connects via included HD cables or regular Component cables to your TV. The movie is accessed on your Mac via an iDisk-like storage component hosted by Apple. Jobs will then explain the pricing structure of the Movie Store. Movies will be available as either a smaller iPod-format (which will cost $9.99 per movie), or as a larger, streamed movie to be streamed to your TV via TubePort. This cost $14.99 per movie. To purchase an iPod-formatted movie and a streamed version of the same movie, it will cost you $19.99." The apple store online is currently updating their site. So you either love it or hate it, right? Well, I don't love it, and I definitely don't hate it. But there is certainly a lot of features I like a lot with the new R56 MINI interior. I'm starting to really like the new steering wheel on the R56 MINI. Those accents on the silver trim pieces are very cool. The accents on the broad ellipse on the door are looking good too. It seems like there is a slight bevel which give it a chiseled look... Very cool. If you look at the center speedo, you just might find another set of controls (mode, music and menu buttons) that resemble the MINI logo. That's what I'm talking about when designers ReCreate instead of ReUse a general theme. Extremely clever and not overly obvious. kudos to them. I found out that chrome circle/button on the dash just below the air vent opposite the steering wheel is the glove compartment latch. Not to mention the start button and option to have the button functional without taking your key out of your pocket. Very trick! There is a new feature where you can switch the illumination color (5 step range from blue to orange), very very cool! not to mention the door storage lighting, nice touch. The new door itself is probably my favorite, but I'm just not sure where the tweeter is yet or if there is one. It does look like there is another speaker in the door where the armrest terminates but that's too big, and tweeters are best located higher up on the door or dash. I also wonder if the steering wheel will telescope forward or not. There are some buttons below the turn stalk on the steering column but I cant really tell what those are for yet. I am also digging the color options of the seats, dash and the door armrest. Us MINI owners love more options. thumbs up. Not to beat a dead horse but I spotted some more of those silver rings that have invaded the new R56 MINI interior. We now have three more to add to the list. The two cup holders and the gear shift surround. These were concealed in the previous photos from MINI2.com I'm surprised there isn't a wheel option or tailpipe design that copies the silver rings concept to the exterior. Just kidding. 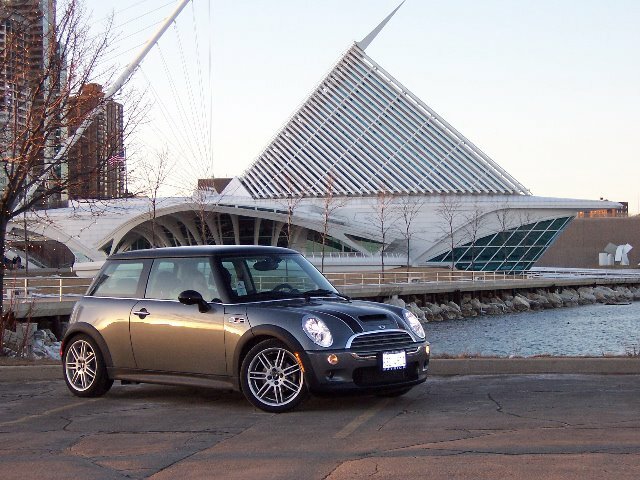 This past sunday was the second presentation from MINI's relatively new ad agency, BSSP. Along with some nice insights of the ad ajency strategy, which seems to be a bit heavy on poking fun at the old SUV segments, there was a 50 mile drive of some of the back roads of Cook and Lake county. This was officially my first club drive as a CMMC member and it was a blast. There were over 50 MINIs there and one Mini too. Thanks to BSSP for coming out to Chicago to give us an inside scoop of future MINI advertising strategies, Thanks to Patrick MINI for hosting all of us, and thanks to CMMC for providing breakfast AND lunch! I had a great time and look forward to the next run. Check out my Flickr Set for more photos as well as the a CMMC Flickr Pool. There are some great picts! More new stuff is coming! Including possibly a new intel version of their power mac desktops (Mac Pro? ), and a new version of their operating system (Leopard?). Well see what else they come up with very soon. While browsing some of MiniMac's photos from the New London to New Brighton Rally, I came across a MINI that I thought my mom would like. She absolutely loves anything with butterflies and has been thinking about adding some cool decals to her jelly bean red Chevy Aveo. I don't know who this MINI belongs to but they gotta be really cool. The butterfly scheme is a great idea and the hood is just jaw dropping. Big thumbs up! And thanks Minimac for sharing those wonderful photos. Be sure to check out his other picts here. Don't worry, you can always unsubscribe at the bottom of each email update and you will only get an email if there is something new at dcmini. And best of all, its free for both you and me. I'm all about that. Woofcast #64 could go down as having the most rants in a single episode. From Wisconsin dialects to portable toilet company names, they sure touched on just about everything. I love to hear those off-topic thoughts, very funny stuff.... And I could have sworn I saw a JCW logo on Gabe's WMS pulley! Just kidding! There even was some ranting over the MCSa, too. I know how much of a pain the MCSa pulley install is for Randy, now that I've seen it done, but at least he has an extra $85 in his pocket for his trouble. I certainly rolled with the punches considering how late it was so no offense was taken as I'm sure none was implied. And thanks for the kind words and mentioning me by name on the podcast, Gabe. It certainly was a pleasure being around great company. Well, I finally took the plunge. After running around in my stock MCSa for about a year without any signs of trouble, I thought it would be safe to go ahead and start modding her up. I closely followed mdsbrain's experiences with modding his MCSa including his most recent effort to demod his MINI due to the numerous problems he has had. After countless hours of research and lurking around the forums, I have found that the 15% pulley, intake, and exhaust were all pretty solid mods that are generally trouble free. I had read how cool Pulley Parties can be, and since they are quickly becoming a thing of the past, I thought it would be great to get Randy Webb of WebbMotorSports to swing by Chicago one last time. The problem was he was already scheduled for Cincinnati and he had no other weekends available for pulley parties. But there was still hope for a Chicago party since there seemed not to be as much interest in Cinci compared to the L.A. or Bay Area pulley parties. If Chicago could get more pulleys than Cinci, Randy would be willing to swing by. The race was on, so I did what I could to try to drum up support and get the word out. After everything was said and done, there were about 8 pulleys for Chicago and 8 pulleys for Cinci, a dead heat! DaveZ had asked on the WMS Chicago thread if it were a possibility for him to swing by before his scheduled pulley party in Cincy, while I had asked the same question on the WMS Cinci thread almost simultaneously. Turns out he was willing drive out to Chicago for a Thursday/Friday pulley party! Very cool! Chicago ended up getting a total of 10 pulleys, a short shifter, a couple of exhausts and 2 HDI boxes. Considering the short notice, I was impressed. I was scheduled for the last install on Thursday night (I switched with IvanC) for a WMS 15% pulley, WMS HDI Intake and Milltek CAT Back Exhaust. Randy was running a little behind when I arrived but not too bad. By the time I was up, my 930pm appointment became a 1200am install. And Randy worked on my MINI for a solid three hours! Wow, I have no idea how he does it, I was tired just watching him work. Ahhh, but the wait was certainly worth it! My MINI welcomed her new mods with more responsiveness and quite a bit more power. The new sounds are absolutely wonderful! The supercharger whine and the low tone of the exhaust definitely sound a bit more commanding but not over powering. Its just about right! My MCSa seems like a new car altogether, and I couldn't be happier. 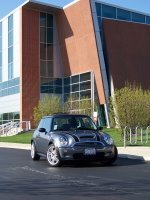 I am very grateful that Randy is so dedicated to these little cars, takes the time to explain his work, philosophy about the way a MINI works, and what's best for the MINI. And pulling those long hours to make a few owners in Chicago just that much happier! I'll be sure to post my impressions as I spend a little more time with my new toys. So far my thumbs couldn't be pointed higher! I had the club application filled out and sitting on my desk for 2 months, just waiting for a reason to mail it in. After reading this NAM Thread and going to meet some of the current members, I decided to go ahead and send it out. And these guys were really cool! I am looking forward to hanging out with them in the near future. Here are some pictures from Tallulah Mae Birthday party posted by MiniMac2005 from NAM. MINI Dee is in the last four pictures parked next to the birthday girl. (The car with the birthday hat! duh.) I had a great time meeting everyone and the cupcakes were delicious! 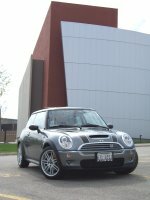 Well since this past Sunday was such beautiful day, I decided to take MINI Dee out for quick photo opportunities. I first went out to the old 3com building in Schaumburg. This is a rather odd looking building but I managed to find a good spot to shoot some pictures. I then stopped by Patrick MINI to snap some picts of Randy's new MCS along side MINI Dee. I then headed up to my old high school stomping grounds and snapped some cool photos. Just after I graduated, my high school proposed a massive addition which actually turned out pretty nice. Also note the new grille badge from toddsmodds.com. Well, I spoke with several body shops and even my dealer and they all pretty much said the same thing; Just leave it alone. 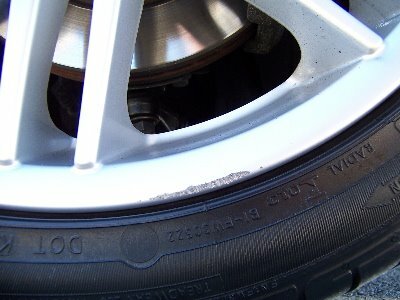 Its hardly noticeable, unless your looking for it, and there is no concern for rust since its an alloy wheel. I also asked about this DIY fix using bondo and everyone said that it was not a good idea to use this on the wheel itself because of the amount of vibration at the wheel. I was listening to WhiteRoofRadio Podcast #50 yesterday and Todd mentioned someone had asked him about the clicking R98 web spokes. Todd then mentioned my trials with these otherwise very cool wheels. Thanks WRR for keeping the masses well informed. As far as I know, nothing specific has been done to remedy the clicking from the web spokes other than the onset of cooler temperatures. With summer right around the corner, and more web spoke owners, I think more cases would probably surface. I have since ditched the web spokes and opted for the R99's double spoke wheels. If anyone has any questions about how to identify if your web spokes are clicking, feel free to email me. It can be a bit tricky to hear them because and its not always consistant. Not sure what wheel you have? Check the MINI wheel guide. It has proven to be quite useful for newbies... including me! Well, it finally happened. After being so careful thus far, the one time I wasn't paying 100% attention, a darn curb jumped out of nowhere. :-( I am contemplating fixing this one myself but it might be more trouble than its worth. Here is a DIY to fix a scratched wheel that I have been studying, but I might just live with it for now. 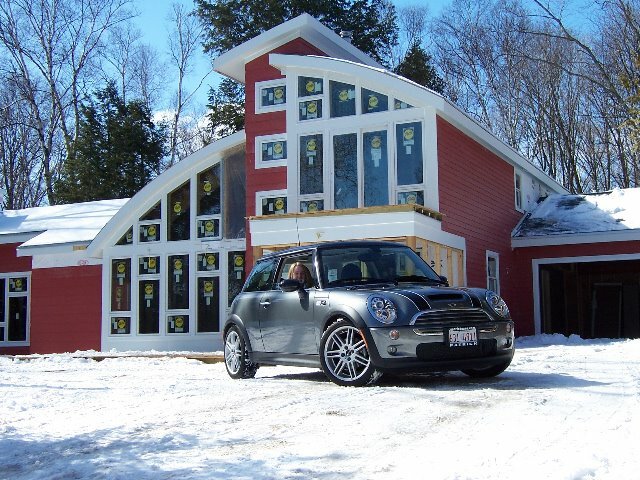 Today marks the one year anniversary of MINI Dee's completion date, and it couldn't have been a better day. Although technically still winter, today was rather spring-like with hardly a cloud in the sky and sunny. I even had a chance to open the sunroof, but that was short lived because it was still in the mid 30's. So to mark this joyous occasion, I took her out for a car-wash and a quick wax job. She was looking good today. And to top it off, she just passed her 7000th mile today with no major problems to date. I'm sure there will be many more (s)miles to come. 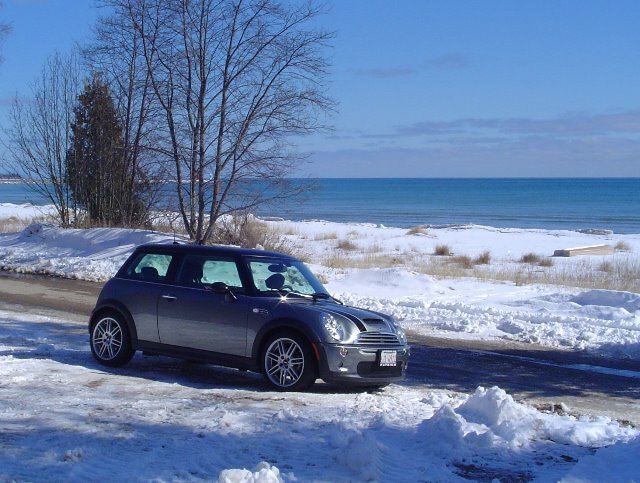 I decided to go on a little MINI adventure this weekend up to Sturgeon Bay, Wisconsin. We designed a vacation home for a client and I thought it would be a great opportunity to see what I have drawn up in real life. This is probably the most contemporary house we have ever designed and it is coming along great. 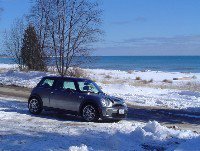 It is located in a secluded part of Door County right on Lake Michigan. The front of the house faces the lake for an awesome view. Not only is this going to be a nice place to relax, it is also going to be built with all the bells and whistles of environmentally friendly building materials. Overall a very cool house. 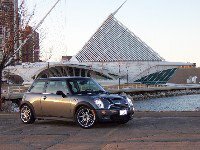 On the way back, we decided to swing buy Milwaukee for a quick photo opportunity with the Milwaukee Art Museum. This is probably the only building worth a second look in Milwaukee. No offense but its not the prettiest city, and they know it. A few years back they commissioned a world famous architect, Santiago Calatrava to help remedy that by designing an addition to there lakefront museum. I am not a huge fan of his work but I can appreciate his extraordinary effort towards the revitalization of Milwaukee. The building is a great place to see in action. The city in general is going through a major reworking of their expressway system so there was a ton of construction activity. Hopefully they will be more sensitive with making the lakefront a little more accessible for the public. They have such a great lake front and its a shame they don't use it to the fullest. Chicago is a great example of how to incorporate a big metro area with the benefits of a lake front. 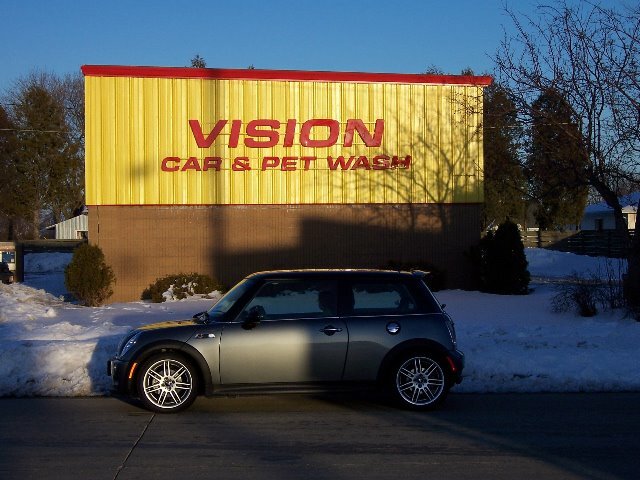 After a long drive, what better thing to do in Wisconsin, than get a quick car and pet wash. What a combo! Although, I could consider my car as my pet, this seems to be a weird pair of activities yet oddly popular.